Home / News / Merchandise / Red Feather Community Chest Movement x Hatsune Miku Artworks & Theme Song Contest Announced! 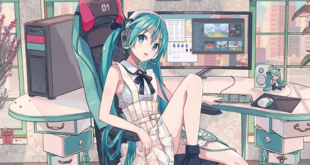 We have been following Hatsune Miku for years now and most fans will certainly remember her collaboration with the Red Feather Community Chest Movement, which has been collaborating with our beloved Digital Diva for the past eight years. Once more, we see the two joining forces by bringing not one contest, but three different categories for you to participate: two illustrations contests for their new poster and a theme song one! Since we are talking about a movement which focuses on making everyone’s daily life better and assisting victims of natural disasters in Japan, we should not be surprised to know that the theme they chose for this contest is “Change!”, precisely, a change for the future. What do you think we should do to increase the happiness among people? Share with them your feelings through your art or a song! This illustration is going to become their next promotional poster, so one of the requirements ask the artists to use at least an A4 format and 350dpi of resolution (3508×2480), be in either JPG or PNG format and use an RGB color mode. Alongside that and the theme chosen for this contest, remember that red feathers are the symbol of this movement and must be included in the artwork. 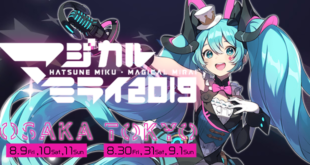 Every Piapro character is allowed for this contest, so feel free to feature as many as you want, just remember that Hatsune Miku must be there as a main character. Since the artwork will be used for promotion, remember to not add any watermark or text on your entry and make sure to keep a psd version of it as they may need it in case your artwork is the winning one! You cannot use any derivative characters (such as Mikudayo, Takoluka etc. 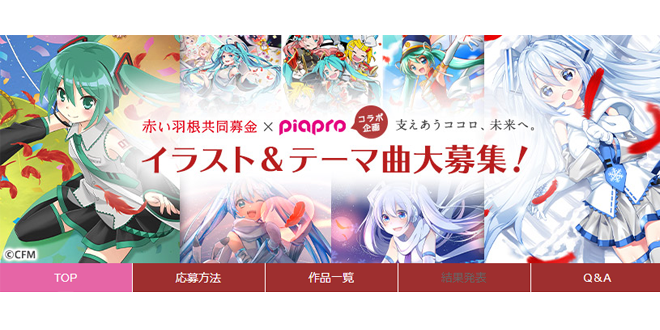 ), only official Piapro ones, and they must not wear any kind of videogame, anime or manga based clothes. However, original designs or edits of their official ones are allowed! Alongside the poster contest, we also get another artwork contest from them. 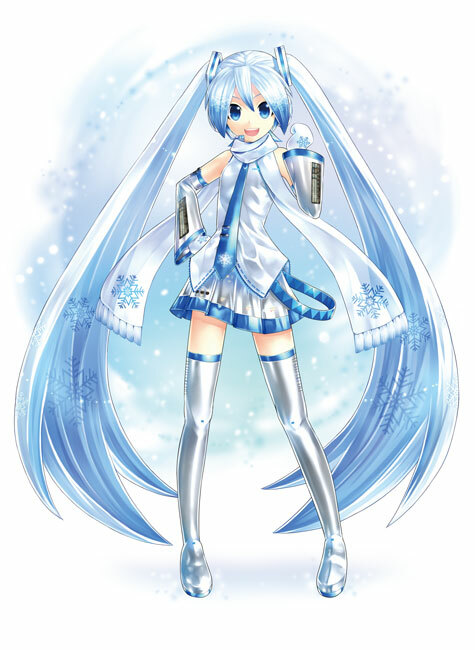 This time the character shall be Snow Miku 2011 (no other version will be admitted). Requirements are the same as the previous one, but no other Piapro character must be included this time: It is Snow Miku 2011’s turn to shine surrounded by red feathers after all! Resolution, once more, needs to be at least A4 format with 350dpi, in RGB color mode and in a JPG or PNG format. Also, there must not be any kind of text and watermarks there. Do not forget to include red feathers and to keep a psd version of your artwork! There is a first time for everything and seems they are also searching for a theme song for their campaign! There is no specific theme or requirement this time, you can even include all of Miku’s friends if you feel like it. The only requirements is for it to be in MP3 format. As always, you may need a Piapro account in order to submit your entry. The deadline is May 21st at 5PM JST. If your entries win the contests, you will receive a certificate, in addition to some merchandise featuring the recruited works. For the poster’s contest, you need to use the “赤い羽根１９＿ポスター” tag. For Snow Miku’s artwork contest, you need to add the “赤い羽根１９＿雪ミク” tag. 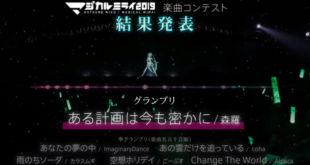 Last but not least, for the Theme Song contest you need to use the “赤い羽根１９＿曲” tag. Do not add quotation marks when copying those tags! By clicking the tags you will get redirected to the category’s submitting page! By submitting your entry, you accept to follow Piapro’s term of usage and submitting methods. They will credit your entry using the name you chose to show on the website. In case there is no preferred name, they will credit you using your nickname/ID on Piapro. You agree for your entry to be used for promotion on the website and in announcements, free of charge, without your direct approval. In case of false statements or information during the application period concerning your registered content, Piapro reserve the right to cancel your application. Be aware that after the entry is adopted, you agree that all copyright (including the rights described in Article 27 and Article 28 of the Copyright Law) will be transferred to the organizer as soon as the work is adopted. Applicants may continue to publish the work on the website that is currently open, but the right to commercialize the work is attributed to the organizer and their designed third parties, so the applicants shall not exercise the author’s moral rights to them both. We cannot wait to enjoy all of the marvelous creations that artists, producers or illustrators will submit in this contest! Good luck to everyone! Do not forget to stay tuned with us on VNN to not lose any updates or news about your favorite virtual singers! Previous DECO*27’s 6th Album “Android Girl” to be Released on May 22nd! Next Fairyland Pre-orders Now Open!